The association agreement was initiated in 2012, but the Ukrainian government suspended preparations for signing the association agreement on 21 November 2013, during the presidency of pro-Russian Viktor Yanukovych, who attended the EU summit in Vilnius on 28–29 November 2013 where the association agreement was originally planned to be signed but it was not. The decision to put off signing the association agreement led to the pro-EU Euromaidan movement. These led to the removal of Yanukovych and his government by parliament after the 2014 Ukrainian revolution in February 2014. Since then, Ukraine has been striving towards integration into the European Union whilst the eastern part of the county has been engaged in pro-Russian unrest, opposing the Euromaidan movement. The political part of the Association Agreement was signed on 21 March 2014 by the new Prime Minister, Arseniy Yatsenyuk. Meanwhile, the EU has attempted to stabilize Ukraine by freezing assets of allegedly corrupt Russians and Ukrainians and by granting financial aid to Ukraine. The economic part of the Ukraine–European Union Association Agreement was signed on 27 June 2014 by the new President, Petro Poroshenko. On 1 January 2016, Ukraine joined the DCFTA with the EU. Ukrainian citizens were granted visa-free travel to the Schengen Area for up to 90 days during any 180-day period on 11 June 2017 and the Association Agreement formally came into effect on 1 September 2017. Ukraine has long been seen as an important  but difficult political partner of the European Union. According to observers,[who?] this is due to such factors as unwillingness of the EU to expand to the post-Soviet space, poor performance of the Ukrainian economy, lack of democracy (during the 1990s) or internal instability (following the Orange Revolution). Also, some experts[who?] notice the importance of the Russian factor in Ukraine-EU relations. The European project has not been completed as yet. It has not been completed because there is no full-fledged participation of Ukraine. We envy Poland, but we believe that Ukraine will be in the European Union. Ukraine's desire to join the European institutions dates back to 1994 when the government declared that integration to the EU is the main foreign policy objective. In reality, little was done since Kiev had to take into account Russia, which remained its major trade partner and natural gas and fossil energy supplier. The political dialogue between the EU and Ukraine started in 1994 when the Partnership and Cooperation Agreement (PCA) was signed. That document was focused on economic and social issues as well as on the necessity of improving public government and guaranteeing free press and civil rights. The framework set for political discussions was modest: yearly meeting between EU Troika and Ukrainian leadership and some inter ministerial consultations. The Partnership and Cooperation Agreement of 1994 entered into force in 1998 and expired in 2008. The first EU-Ukraine summit took place in September 1997 in Kiev. During the second summit in October 1998 in Vienna, Ukraine–EU relations were defined as a "strategic and unique partnership" and Ukraine first declared its desire to acquire associate membership in the EU. None of top level meetings brought major changes to a reserved EU approach. Leaders focused chiefly on post-communism economic transition and human rights records as well as on issues connected to the Chernobyl nuclear power plant and its containment. In 2002, EU Enlargement Commissioner Günter Verheugen said that "a European perspective" for Ukraine does not necessarily mean membership within 10 to 20 years; however, it is a possibility. The same year Ukrainian President Leonid Kuchma stated that Ukraine wanted to sign an association agreement with the EU by 2003–2004 and that his country would meet all EU membership requirements by 2007–2011. Left to right: Then Ukrainian Prime Minister Yulia Tymoshenko and President Viktor Yushchenko meeting with European Council President Herman Van Rompuy in 2009. The Orange Revolution of late 2004 improved Ukraine's European prospects; the opposition leader Viktor Yushchenko hinted that he would press the EU for deeper ties and described a four-point plan: acknowledgment of Ukraine as a market economy, entry in the World Trade Organization, associate membership in the European Union, and, finally, full membership. Ukrainian President Viktor Yushchenko asked Brussels mid-December 2004 for a clearer indication of Ukraine's prospects for membership, saying that "The approved Action Plan reflects only the level of Ukraine-EU relations that we could have reached before the presidential elections in 2004." On 13 January 2005, the European Parliament almost unanimously (467 votes to 19 in favour) passed a motion stating the wish of the European Parliament to establish closer ties with Ukraine in view of the possibility of EU membership. Though there is still a long way to go before negotiations about EU membership can start, the European Commission has stated that future EU membership will not be ruled out. Yushchenko has responded to the apathetic mood of the Commission by stating that he intends to send an application for EU membership "in the near future" and that he intends to scrutinise Ukraine's relationship with the Commonwealth of Independent States in order to assure that EU integration is possible, and, if not, to make it possible. Several EU leaders have already stated strong support for closer economic ties with Ukraine, but have stopped short of direct support for such a bid. On 21 March 2005, Polish Foreign Minister Adam Daniel Rotfeld noted that Poland will, in every way, promote Ukraine's desire to be integrated with the EU, achieve the status of a market-economy country, and join the World Trade Organization. He also said, "At the present moment, we should talk concrete steps in cooperation instead of engaging in empty talk about European integration". Three days later, a poll of the six largest EU nations conducted by a French research company showed that the European public would be more likely to accept Ukraine as a future EU member than any other country that is not currently an official candidate. In October 2005, Commission president José Manuel Barroso said that the future of Ukraine is in the EU. On 9 November 2005, however, the European Commission in a new strategy paper suggested that the current enlargement agenda (Croatia and in the future the other ex-Yugoslavian countries) could block the possibility of a future accession of Ukraine, Armenia, Belarus, Georgia, and Moldova. Commissioner Olli Rehn said that the EU should avoid overexpansion, adding that the current enlargement agenda is already quite full. According to the Ukrainian authorities, the ENP is not an adequate political instrument, since joining the EU was one of principal objectives of all governments since 1994. After the Orange Revolution of 2004 that brought to power Viktor Yushchenko, the EU commission was very slow to react: little progress was made to put the largest European country on a path to eventual membership. In March 2007, the EU and Ukraine started talks about a new "wider agreement", aiming at offering a legal framework for a closer economic cooperation and a better political dialogue. It was agreed that Ukraine and the EU would start a parallel negotiation concerning setting up a free trade area. Later in 2007 it was announced that this issue would be incorporated into the draft agreement as a separate chapter. Days before the summit, the Ministers of foreign affairs of Member States agreed during their meeting in Avignon (France) that association agreement to be signed with Ukraine will have nothing to do with the association agreements the EU signed with many Eastern European States (from Poland to Romania in the beginning of the 1990s, Western Balkans by the end of the 1990s). Media reported that the Netherlands, Belgium, Luxembourg and Germany were strongly opposed to including "Ukraine is a European State" into EU legally binding documents. This was considered a failure of Kuchma-era politician Mr. Roman Shpek, then Ukrainian ambassador to Brussels. He was replaced by Mr. A. Veselovskyy, a more experienced diplomat. A Joint EU–Ukraine Action Plan was endorsed by the European Council on 21 February 2005. It was based on the Partnership and Cooperation Agreement of 1994 and provided, according to the European Commission, a comprehensive and ambitious framework for joint of work with Ukraine in all key areas of reform. Talks on a free trade agreement between Ukraine and the European Union started on 18 February 2008 between the Ukrainian government and the EU Trade Commissioner. Portugal publicly stated it supports Ukraine's EU accession in July 2008. On 22 July 2008, it was announced that a "Stabilisation and Association" -type agreement would be signed between Ukraine and the EU on 8 September 2008 in Évian-les-Bains. On 2 October 2008, Ukraine President Yushchenko announced that the Association agreement between the country and the EU would be signed "within six-eight months". On that day, he met with the King of Sweden Charles XVI Gustav, who paid a state visit to Kiev. According to Yushchenko, "the agreement is half-ready, and he hopes that there will be a possibility to finalise and sign it under Swedish presidency in the EU". He also welcomed the initiative of Eastern Partnership suggested earlier by Polish and Swedish Foreign Ministers. On 20–24 October 2008, the EU and Ukraine held a negotiation round on the free trade area chapter of the Association agreement. According to some Ukrainian media,[who?] the "EU promised to liberalise trade relations". Ukraine's representative told that one must not "focus too much" on negotiation since there is much to be done by Ukrainian government to meet certain criteria. He also said, that "soon, the Balkans will enter into the European trade space and therefore Ukraine might lose these markets". This was seen as a reason for Ukraine to move forward as least as soon as Balkans, the EU did not comment on that perception. On 29 October 2008, the EU Commissioner Jacques Barrot and Ukrainian officials met in Brussels to launch negotiations on visa-free travel. Kiev had been asking for a "road map" to visa lifting, including travel document security, irregular migration, public order and foreign relations. But the EU justice commissioner avoided to give any specific dates. Moreover, the Ukrainian side argued that 2007 visa facilitation agreement is not fully implemented by the EU member states. The European Commission representative was quoted as saying that Brussels is ready to impose sanctions against those who do not respect the agreement. Spanish, Dutch, German and Belgian embassies were cited among the most active rule breakers. Making visa processing lengthy and expensive is one of major agreement violation. On 28 October 2008 Belgian PM Yves Leterme told that Ukrainians need to avoid middlemen in visa procedures if they want to reduce their cost. The problem is that some consulates, including Belgian, oblige visa seekers to deal with a middleman. According to Ukrainian President Yushchenko, some embassies of EU countries often require Ukrainians to present documents, which had not been foreseen in the agreement on simplification of visa regulations. Around five per cent of Ukrainians willing to travel to the EU are denied visas, which, according to Yushchenko, "does not meet the standards of our agreements with the EU". On 4 June 2009, some media outlets reported that Germany's Free Democratic Party openly stated in its programme that Ukraine has the right for the EU membership in the long term. This was the first major German political party to state this. On 16 June 2009, a new practical instrument was adopted – the EU-Ukraine Association Agenda. In September 2009, high-ranking Ukrainian diplomats proposed that Ukraine apply for EU membership after the presidential election in January 2010, around March 2010, which would mean that the official response to the application would likely take place in early 2011 during the Polish presidency of the European Union. However, this hasn't happened. On 5 October 2009, the Chairman of the Committee of the Verkhovna Rada on issues of European integration Borys Tarasyuk commented "the EU see the implementation of a free visa regime for Ukrainians travelling to member states of the European Union only as a long-term prospect". Ukrainian politicians continue to insist that the implementation of that free visa regime take place by 2012, when the European Football Championship will be held in Ukraine and Poland. According to Tarasyuk, the main obstacles to the implementation of a free visa regime between Ukraine and EU is the fact that Ukraine "hasn't finished its work on legislation concerning forming a demographic [database], which then could become a good basis for issuing biometric passports" and the fact that there is no general database on the issuing of foreign passports to Ukrainian citizens. According to Tarasyuk the EU fear that this grants the opportunity for mass falsification. On 16 December 2009 the European Commission President Jose Manuel Barroso stated "our Ukrainian friends need to do more if they want us to help them more." He also stated that "enlargement is not possible in the current situation." Ukraine is one of six post-Soviet nations to be invited to cooperate with the EU within the new multilateral framework that the Eastern Partnership is expected to establish. However, Kiev pointed out that it remains pessimistic about the "added value" of this initiative. Indeed, Ukraine and the EU have already started the negotiations on new, enhanced political and free-trade agreements (Association and Free-Trade Agreements). Also, there has been some progress in liberalising the visa regime despite persistent problems in the EU Member States' visa approach towards Ukrainians. That is why Ukraine has a specific view of the Eastern Partnership project. According to the Ukrainian presidency, it should correspond, in case of his country, to the strategic foreign policy objective, i.e. the integration with the EU. Yet, the Eastern Partnership documents (the European Council Declaration of May 2009) do not confirm such priorities as political and economic integration or lifting visas. Ukraine has expressed enthusiasm about the project. Ukraine deputy premier Hryhoriy Nemyria said that the project is the way to modernise the country and that they welcome the Eastern Partnership policy, because it uses 'de facto' the same instruments as for EU candidates. Under the Eastern Partnership, Poland and Ukraine have reached a new agreement replacing visas with simplified permits for Ukrainians residing within 30 km of the border. Up to 1.5 million people may benefit from this agreement, which took effect on 1 July 2009. In May 2010, President Viktor Yanukovych promised to adopt in June 2010 the legislation necessary for creating a free trade zone between Ukraine and the European Union (EU). [nb 1] Yanukovych expected visas between Ukraine and EU member states to be abolished and that a free trade zone will be created by March 2011. The Azarov Government continued to pursue EU-integration. During May and June 2010 both Prime Minister Mykola Azarov and Ukrainian Foreign Minister Kostyantyn Gryshchenko stated that integration into Europe has been and remains the priority of domestic and foreign policy of Ukraine. The policies of the Azarov Government do not exclude EU integration, the EU Commissioner for Enlargement Štefan Füle stated on 12 May 2010. 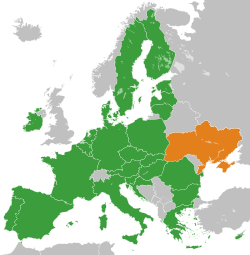 "An action plan for Ukraine toward the establishment of a visa-free regime for short-stay travel" between the European Council and Ukraine was agreed on 22 November 2010. This roadmap requests major improvements in Ukrainian border control, migration and asylum policies. Attempts to change the French constitution are currently being carried forward in order to remove the compulsory referendum on all EU accessions of countries with a population of more than 5% of the EU's total population; this clause would apply to Ukraine and Turkey. The EU Association Agreement (AA) was initialed on 30 March 2012 in Brussels; but as of November 2012 the 27 EU governments and the European Parliament had yet to sign the accord. The treatment and sentencing (considered by EU leaders as a politically motivated trial) of former Prime Minister of Ukraine Yulia Tymoshenko have strained the relations between the EU and Ukraine. The European Union and several of its member states, notably Germany, have been pressuring Ukrainian President Viktor Yanukovich and his Azarov Government to halt the detention of Tymoshenko in fear of her degrading health. Several meetings with Yanukovich have been deserted by EU leaders, including the German president Joachim Gauck. At the request of opposition politicians in Ukraine, EU government officials boycotted the UEFA Euro 2012 soccer championship in Ukraine. EU leaders have suggested that the AA, and the Deep and Comprehensive Free Trade Agreement, will not be ratified unless Ukraine addresses concerns over a "stark deterioration of democracy and the rule of law", including the imprisonment of Tymoshenko and Yuriy Lutsenko in 2011 and 2012. A 10 December 2012 statement by the EU Foreign Affairs Council "reaffirms its commitment to the signing of the already initialed Association Agreement, including a Deep and Comprehensive Free Trade Area, as soon as the Ukrainian authorities demonstrate determined action and tangible progress in the three areas mentioned above, possibly by the time of the Eastern Partnership Summit in Vilnius in November 2013". These three areas are: "Electoral, judiciary and constitutional reforms (in line with international standards are integral parts of it and commonly agreed priorities)". Kostiantyn Yelisieiev, Ukraine's Ambassador to the EU, responded in February 2013 by rejecting any preconditions by the EU for signing the AA. However, on 22 February 2013 a resolution was approved by 315 of the 349 registered members of the Verkhovna Rada stating that "within its powers" the parliament would ensure that 10 December 2012 EU Foreign Affairs Council "recommendations" are implemented. At the 16th EU-Ukraine summit of 25 February 2013, President of the European Council Herman Van Rompuy followed up on the December 2012 EU Foreign Affairs Council statement by reiterating the EU's "call for determined action and tangible progress in these areas – at the latest by May, this year". The same day President Yanukovych stated Ukraine will "do its best" to satisfy the EU's requirements. At the time President Yanukovych was also in negotiations with Russia to "find the right model" for cooperation with the Customs Union of Belarus, Kazakhstan and Russia. But also on 25 February 2013 President of the European Commission José Manuel Barroso made it clear that "one country cannot at the same time be a member of a customs union and be in a deep common free-trade area with the European Union". To coordinate preparation of Ukraine for European integration, the Government of Ukraine has adopted a Plan on Priority Measures for European Integration of Ukraine for 2013. Successful implementation of the plan is assumed as one of the conditions necessary for signing of the Association Agreement, planned for 29 November 2013 during Eastern Partnership Summit in Vilnius. In March 2013, Stefan Fuele, the EU's Commissioner for Enlargement, informed the European Parliament that while Ukrainian authorities had given their "unequivocal commitment" to address the issues raised by the EU, several "disturbing" recent incidents, including the annulment of Tymoshenko's lawyer Serhiy Vlasenko's mandate in the Verkhovna Rada (Ukraine's parliament), could delay the signing of the agreements. However, the next day the Ukrainian Ministry of Foreign Affairs expressed its optimism that they would still be signed in November. On 7 April 2013 a decree by President Yanukovych freed Lutsenko from prison and exempted him, and his fellow Minister in the second Tymoshenko Government Heorhiy Filipchuk, from further punishment. On 3 September 2013 (at the opening session of the Verkhovna Rada after the summer recess) President Yanukovych urged his parliament to adopt laws so that Ukraine will meet the EU criteria and it can sign the Association Agreement in November 2013. On 18 September the Ukrainian cabinet unanimously approved the draft association agreement. On 25 September 2013 Chairman of the Verkhovna Rada Volodymyr Rybak stated that he was sure that his parliament would pass all the laws needed to fit the EU criteria for the Association Agreement since, except for the Communist Party of Ukraine[nb 2], "The Verkhovna Rada has united around these bills". On 20 November 2013 EU's Commissioner for Enlargement Fuele stated he expected that the Verkhovna Rada would consider and adopt the remaining bills necessary for the signing of the association agreement, planned for 29 November 2013, the next day. On 21 November 2013 the Verkhovna Rada failed to pass any of the six motions on allowing former Prime Minister Yulia Tymoshenko to receive medical treatment abroad, which was an EU demand for signing the association agreement. The same week Tymoshenko had stated that she was ready to ask the EU to drop the demand for her freedom if it meant President Viktor Yanukovych would sign the association agreement. The same day a Ukrainian government decree suspended preparations for signing of association agreement; instead it proposed the creation of a three-way trade commission between Ukraine, the European Union and Russia that would resolve trade issues between the sides. Prime Minister Mykola Azarov issued the decree in order to "ensure the national security of Ukraine" and in consideration of the possible ramifications of trade with Russia (and other CIS countries) if the agreement was signed on a 28–29 November summit in Vilnius. The suspension of the association agreement signature initiated a wave of protests that would ultimately overthrow Viktor Yanukovych and his government. On 2 December 2013 President of the European Commission José Manuel Barroso agreed to meet with a delegation from Ukraine to discuss closer ties with the EU but stated there would be no re-opening of negotiations on the proposed Association Agreement. The same day First Vice Prime Minister of Ukraine Serhiy Arbuzov announced that Ukraine planned to sign a "roadmap" with the EU. "I'm not talking about the conditions of the association but about the conditions we planned to resolve before signing and after signing". Ukraine and the EU started "conducting technical preparations for the upcoming dialogue between Ukraine and the EU on certain aspects of the implementation of an Association Agreement" on 5 December 2013. However, on 15 December Fuele said that the Ukrainian government's negotiating position had "no grounds in reality" and that they were suspending further talks. Barroso said "We are embarked on a long journey, helping Ukraine to become, as others, what we call now, 'new member states'. But we have to set aside short-term political calculations." On 17 December, Ukraine signed a treaty with Russia under which Russia will buy $15 billion of Ukrainian Eurobonds and the cost of Russian natural gas supplied to Ukraine will be reduced, though Putin stated that "today we have not discussed the issue of Ukraine joining the Customs Union [of Belarus, Kazakhstan, and Russia] at all". [nb 3] Three days later, high ranking EU-officials stated that the EU is still ready to sign the Association Agreement "as soon as Ukraine is ready for it", that the agreement was also beneficial for Russia and that the EU "is totally not concerned about the fact that Ukraine is signing agreements with Russia". On 23 December 2013 Russian presidential aide Yuri Ushakov stated "there is no contradiction" in Ukraine's association with the EU and their observer status in the Customs Union of Belarus, Kazakhstan, and Russia and the Eurasian Economic Union. On 20 December 2013 Chairman of the Verkhovna Rada (Ukraine's parliament) Volodymyr Rybak did not rule out the possibility of signing an Association Agreement between Ukraine and the EU without the creation of a free trade area (FTA). On 24 December 2013 Minister of Foreign Affairs of Ukraine Leonid Kozhara stated that "at the present time" his Ministry's "and other government agencies' efforts are focused on further negotiations with the EU to provide conditions for implementing the association agreement". He added that "Ukraine will resume the negotiations on this agreement after the holidays" and that the text of the Association Agreement itself would not be changed, but that Ukraine intended to focus on the issues related to its implementation. On 15 January 2014 Ukrainian Prime Minister Mykola Azarov gave an interagency (ministries and other agencies) working group two months to draw up a plan "on conditions of the implementation of the Association Agreement" for negotiations with the EU. Viktor Yanukovych and his government were removed from their post by parliament after the 2014 Ukrainian revolution in February 2014. The ouster of Yanukovych plunged Ukraine into the 2014 Crimean crisis and the 2014 pro-Russian conflict in Ukraine. In March 2014 the EU condemned the Annexation of Crimea by Russia and Russia's "clear violation of Ukrainian sovereignty and territorial integrity by acts of aggression by the Russian armed forces". The EU also froze (and tried to recover) "misappropriated Ukrainian state funds" and froze assets and blocked entry into the EU of Russians and Ukrainians deemed responsible for the unrest in Ukraine. The political part of the Association Agreement was signed on 21 March 2014 by new Prime Minister Arseniy Yatsenyuk, with the remaining parts of the agreement concerning free trade being deferred pending May elections. Customs duties for Ukrainian exports to the EU were temporarily removed in April 2014. Financial help was also promised to Ukraine. Ukraine was granted a macro-financial aid bilateral loan of one billion Euro in May 2014. Following the election, new President of Ukraine Petro Poroshenko and the European Union signed the economic part of the Association Agreement on 27 June 2014. President of the European Council Herman Van Rompuy described the signing as a "great day for Europe". Signatory (then new) President of Ukraine Petro Poroshenko called it "Ukraine is underlining its sovereign choice in favour of membership of the EU", and also described it as Ukraine's "first but most decisive step" towards EU membership. Poroshenko also set 2020 as a target for an EU membership application. As the Voice of America reported on 27 June, "Terms of the EU agreements require Georgia, Moldova and Ukraine not enter into similar free trade agreements with the Kremlin." On 16 September 2014 the Verkhovna Rada approved the draft law on ratification of the Association Agreement between Ukraine and the European Union, which was signed the same day by President Petro Poroshenko. The 17th EU-Ukraine summit took place on 27 April 2015 in Kiev. During an Eastern Partnership summit in Riga in May 2015, EU agreed on a €1.8bn loan to Ukraine. On 1 January 2016, the Deep and Comprehensive Free Trade Area between Ukraine and the EU entered into force. By April 2016, the Association Agreement had been ratified by Ukraine and all EU member states except the Netherlands, which held a referendum on approval of the treaty. Following the rejection of the agreement in the referendum, Prime Minister of the Netherlands Mark Rutte said that ratification would be put on hold during negotiations with the other parties to the treaty to find a compromise. In December 2016, a decision of the heads of state or government of the EU member states was approved which made legally binding interpretations of the agreement to address the concerns raised in the referendum. In particular, it stated that it did not commit the EU to grant Ukraine EU membership candidate status, provide security guarantees, military of financial aid, or free movement within the EU. The decision would enter into force if the Netherlands ratified the agreement, which needed to be approved by its parliament. In late January 2017, the Dutch government introduced a bill to confirm approval of the agreement. The Dutch House of Representatives approved the bill on 23 February 2017. The Senate approved the bill on 30 May 2017. In the hopes of continued integration with both the EU and Nato, President Poroshenko has announced plans for a European patronage system throughout Donbass in preparations for the 2019 election. Describing this plan the President stated, "We have already discussed several times with the leaders of the European Union the program of establishing a kind of patronage by certain countries over certain cities and towns of Donbass, let Germany take responsibility for Kramatorsk, let Greece for Mariupol, let Great Britain for Volnovaha, let other countries take Severodonetsk, Lisichansk, Avdeevka." The political dialogue between the EU and Ukraine started in 1994 when the Partnership and Cooperation Agreement (PCA) was signed. That document was focused on economic and social issues as well as on the necessity of improving public government and guaranteeing free press and civil rights. The framework set for political discussions was modest: yearly meeting between EU Troika and Ukrainian leadership and some inter ministerial consultations. The Partnership and Cooperation Agreement of 1994 entered into force in 1998 and expired in 2008. None of the top level meetings brought any major changes to a reserved EU approach. Leaders focused chiefly on economic transition and human rights records as well as on issues connected to the Chernobyl nuclear power plant and its containment. A Joint EU–Ukraine Action Plan was endorsed by the European Council on 21 February 2005. It was based on the Partnership and Cooperation Agreement of 1994 and provided, according to the European Commission, a comprehensive and ambitious framework for joint work with Ukraine in all key areas of reform. The Eastern Partnership is a forum aiming to improve the political and economic trade-relations of the six Post-Soviet states of "strategic importance" – Ukraine, Belarus, Moldova, Azerbaijan, Armenia and Georgia with the European Union. The EU draft of the EaP states that: "Shared values including democracy, the rule of law, and respect for human rights will be at its core, as well as the principles of market economy, sustainable development and good governance." The Partnership is to provide the foundation for new Association Agreements between the EU and those partners who have made sufficient progress towards the principles and values mentioned. Under the Eastern Partnership, Poland and Ukraine have reached a new agreement replacing visas with simplified permits for Ukrainians residing within 30 km of the border. Up to 1.5 million people may benefit from this agreement which took effect on 1 July 2009. An Association agreement (AA) between Ukraine and the EU was negotiated from 2009–2011, and should replace the existing PCA. The AA aims for political association and economic integration, includes a "deep and comprehensive free trade area", and runs parallel to the negotiations for a visa-free regime. It does not contain a membership perspective for Ukraine, though it recalls it as "a European country with European identity" and says that "the EU acknowledged the European aspirations of Ukraine". On 16 June 2009, a new practical instrument was adopted – the EU-Ukraine Association Agenda. 19 December 2011 EU-Ukraine summit, which was intended to lead to the signature of the Agreement, fell short due to the EU's concerns over the jailing of former premier Yulia Tymoshenko. The end of negotiations were announced, but the text of the agreement was not signed with EU leaders deciding to wait until the October 2012 Parliamentary elections as a test of the vitality of democracy and rule of law in Ukraine. The AA was initialed shortly thereafter, on 30 March 2012. Before it enters into force it must be ratified by the Ukrainian Parliament, the European Parliament, and each EU member state. However, EU leaders have suggested that the agreement will not be ratified unless Ukraine addresses concerns over a "stark deterioration of democracy and the rule of law", including the imprisonment of Yulia Tymoshenko and Yuriy Lutsenko in 2011 and 2012. In November 2012, EU Commissioner for Enlargement and European Neighbourhood Policy Stefan Fule stated that the AA, and DCFTA, could be signed in November 2013 if the EU's concerns were addressed. However, in February 2013 Fule warned Ukraine that the agreements could be abandoned if the required reforms are not made quickly. He also stated that Ukrainian membership in the Customs Union of Belarus, Kazakhstan and Russia would be incompatible with the agreements with the EU. While work on signing a deep and comprehensive free trade agreement between Ukraine and the EU first began in 1999, formal negotiations between the Ukrainian government and the EU Trade Commissioner were not launched until 18 February 2008 . As of May 2011 there remained three outstanding issues to be resolved in the free trade deal: quotas on Ukrainian grain exports, access to the EU's services market and geographical names of Ukrainian commodities. Aside from these issues, the deal was ready. Despite those outstanding issues, Ukraine was ready to sign the agreement as it stood. Although it wanted stronger wording on enlargement prospects and access to the EU market for its truckers, Ukraine had more than many other candidates at the equivalent stage of the process. The finalised agreement was initialed on 19 July 2012. Ratification of the DCFTA, like the AA, has been stalled by the EU concerns over the rule of law in Ukraine. This includes the application of selective justice, as well as amending electoral laws. As a result, the role of Ukrainian oligarchs in sanctioning the agreement was also questioned. If Ukraine would choose the agreement, the Eurasian Economic Commission's Customs Union of Belarus, Kazakhstan and Russia would withdraw from free trade agreements with the country, according to Russian presidential advisor Sergei Glazyev. However, on 21 November 2013 a Ukrainian government decree suspended preparations for signing the agreement[nb 8] that was scheduled to be signed during a 28–29 November 2013 EU summit in Vilnius, and it was not signed. [nb 9] The decision to put off signing the association agreement led to 2014 Ukrainian revolution. EU sanctions against Russia related to its military intervention in eastern Ukraine have been extended until July, 2016. On 1 January 2016, the DCFTA entered into force. On 22 November 2010 the European Council and Ukraine announced "an action plan for Ukraine toward the establishment of a visa-free regime for short-stay travel". This roadmap outlined major improvements in Ukrainian border control, migration and asylum policies. According to The Wall Street Journal, for the EU, "the visa-free regimes are a key tool for binding their neighbors closer and for advancing reforms in those countries". Negotiations for an amendment to the 2007 Visa Facilitation agreement, which expanded the subset of individuals eligible for simplified visa procedures to include students, NGO representatives and holders of official passports, were finalised in December 2011, and the Visa Facilitation Agreement was ratified by the Verkhovna Rada on 22 March 2013. On 18 April 2013 the European Parliament followed suit, and the European Council finalised the agreement on 13 May 2013. In December 2011 former Ukrainian President Viktor Yanukovych expected negotiations for full visa-free travel to be completed by the end of 2014. The European Commission stated in November 2013 that Ukraine must strengthen its anti-discrimination laws before the visa-free regime is established. The Verkhovna Rada (Ukraine's parliament) adopted the remaining four bills needed for the transition to the second (implementation) phase of the Visa Liberalisation Action Plan in May 2014 (including bills on improving anti-discrimination laws). When addressing MPs before the vote on these bills Verkhovna Rada Chairman and acting President Oleksandr Turchynov predicted then that "the visa-free regime will be introduced by the end of this year". However, Ukraine should have adopted bills that addresses for six conditions[nb 10] needed for the fulfilment of the Visa Liberalization Action Plan before 15 December 2015. On that day the EU will decide whether the country will get the visa-free regime in 2016. In December 2015, the Commission issued a progress report that found that Ukraine met all the conditions for its citizens be granted visa free travel to the Schengen Area. The European Commission formally proposed Ukraine be granted visa free travel in April 2016. This was later delayed by the EU, postponing the possible date of an agreement to September 2016. The Committee of Permanent Representatives gave its approval in November 2016. Visa-free scheme, that will allow Ukrainians with a biometric passport to visit the Schengen Area for a period of stay of 90 days in any 180-day period, would come into force once it is agreed and formally adopted by the European Parliament and the European Council. In December, the EU agreed that European Commission or an EU state will be able to suspend the visa waiver for Ukrainians for up to nine months in case of emergencies such as if "[Ukraine fails] to cooperate in taking back illegal migrants, there’s a spike in the number of asylum applications, or a security issue arises". The visa-free regime deal was agreed by the EU Parliament and Council on 28 February 2017, approved by the MEPs on 6 April and by the European Council on 11 May. It entered into force on 11 June 2017. Both Ukraine and all EU member states are signatories of the Energy Charter Treaty (ECT), a legally-binding treaty negotiated following the 1991 Energy Charter political declaration of principles for international energy including trade, transit and investment. The ECT was signed in December 1994 and came into effect in April 1998. Ukraine and all EU member states are also signatories of the 1998 Trade Amendment reflecting the change from the GATT to the WTO. After its entry into force, Ukraine held an Observer status for the Treaty establishing the Energy Community (also referred as European Energy Community), a community established between the European Union (EU) and a number of third countries in order to extend the EU internal energy market to South East Europe and beyond. The Treaty establishing the Energy Community was signed in Athens, Greece, on 25 October 2005, and entered into force on 1 July 2006. Ukraine soon expressed its interest in full membership. Mandated by the Energy Community Ministerial Council, the European Commission had the first round of formal negotiations with Ukraine in late 2008. After three negotiation rounds, the technical negotiations with Ukraine were concluded in 2009. The Ministerial Council, however, made the membership conditional on legislative amendments. In concrete, it requested Ukraine to revise its gas law so that it complies with EU's Gas Directive 2003/55/EC. Following the amendment of the gas law in July 2010, Ukraine signed the Energy Community Accession Protocol on 24 September 2010, ratified the Treaty on 15 December 2010 and officially acceded the Energy Community on 1 February 2011. During the 1990s, Germany, the Netherlands and Italy remained major trading partners of Ukraine. According to Eurostat, between 2000 and 2007 EU trade in goods with Ukraine more than tripled in value: exports rose from 5.5 bn Euro to 22.4 bn, while imports increased from 4.8 bn Euro to 12.4 bn. Nevertheless, this increase didn't make Ukraine one of the EU's major trading partners. In 2007, Ukraine accounted for only 2% of EU exports and a mere 1% of European Union imports which is toward the bottom of the EU's top 20 trading partners (16th). According to the European commission paper, trade with Ukraine is dominated by manufactured goods. Nearly half of the EU exports to Ukraine in 2007 were machinery and vehicles and a further quarter were other manufactured articles. A quite similar structure can be seen in imports: unspecified manufactured articles accounted for two fifths followed by a crude metal for a further fifth. At the more detailed level, the main EU exports to Ukraine in 2007 were medicine, motor vehicles and mobile phones, while the main imports were iron and steel products, as well as sunflower seed oil, ferro-nickel, iron ores and oil. Among the EU27 Members States, Germany (5.9 bn Euro or 26% of EU exports) was the largest exporter, followed by Poland (4.1 bn or 18%). Italy (2.4 bn or 19%) was the largest importer followed by Bulgaria (1.6 bn or 13%) and Germany (1.3 bn or 11%). The largest surpluses in trade with Ukraine in 2007 were observed in Germany (+ 4.6 bn Euro) and Poland (+2.8 bn Euro) while Bulgaria scored the highest deficit ( -1.4 bn Euro). For the 2000–2006 budgetary period, the financial assistance of the EU to Ukraine was framed in the TACIS programme, established in 1991, a programme of technical assistance that supports the process of transition to market economies for the 11 CIS countries and Georgia. Since 2009, with the accession of Ukraine to the World Trade Organization, economic relations between the EU and Ukraine have to respect the WTO normative acquis. The EU has always believed that WTO membership can play a key role in supporting Ukraine's economic reform, especially in the context of a transition economy. In joining the WTO, Ukraine benefits from secure access to the markets of all WTO members and commits to providing the kind of stable trade and investment environment that will attract further trade and investment. In a November 2014 poll by Rating joining the EU was supported by all but 2 Oblasts of Ukraine (provinces); in Luhansk Oblast and Donetsk Oblast (an area known as Donbass) people preferred Ukraine's accession to the Eurasian Customs Union. Traditionally Western Ukraine is found to be generally more enthusiastic about EU membership than Eastern Ukraine. In July 2012 and in May 2014 residents of West Ukraine (74% in July 2012 and 81% in May 2014), Central Ukraine (59% and 64%) and North Ukraine (56% and 71%) were the biggest supporters for EU membership. A June 2013 poll, on behalf of Deutsche Welle, found that 52% of Eastern Ukraine was in favor of joining the EU. But in a poll by ComRes (for CNN) in May 2014 only 19% of Eastern Ukraine considered Ukraine joining the European Union "Good". The May 2014 ComRes poll found out that in the 3 most eastern Oblasts of Ukraine (provinces), Kharkiv Oblast, Donetsk Oblast and Luhansk Oblast, 37% favored an alliance with Russia, 14% backed an alliance with the European Union and 49% stated Ukraine would be better off if it did not ally with either. Citizens aged between 20–39 appeared to be the strongest supporters of joining the EU in May 2010 and December 2011 (in December 2011 the opinion of the age group 18–29 did not vary from one region to another). In the May 2014 ComRes poll people aged between 36 and 55 where the strongest supporters of joining the EU. Ukraine's EU ambassador, Kostiantyn Yelisieiev, stated in July 2011 that business tycoons and politicians from Ukraine's Russian speaking east were as much pro-EU as the Ukrainian speaking west of the country: "If any politician today in Ukraine declared himself to be against European integration, he would be politically dead." According to a poll conducted in February 2015 in all regions of Ukraine except Crimea, 66.4% would have voted in favor of joining the EU and 33.6% against with a turnout of 76.4%. June 2018 51 % n/a n/a n/a Sociological group "RATING"
According to the Eastern Partnership policy, Ukraine can become a member of the European Union. On 27 February 2014 the European Parliament passed a resolution that recognized Ukraine's right to "apply to become a Member of the Union, provided that it adheres to the principles of democracy, respects fundamental freedoms and human and minority rights, and ensures the rule of law". In March 2016, President of the European Commission Jean-Claude Juncker stated that it would take at least 20–25 years for Ukraine to join the EU and NATO. In June 2018, President of Ukraine Petro Poroshenko said he expected Ukraine will join both the European Union and the North Atlantic Treaty Organisation by 2030. On 3 July 2014 Ukraine became indirectly represented in the European Parliament by Andrea Bochkor who is member of the Hungarian ruling party Fidesz, has a dual citizenship and resides in Berehove, Zakarpattia Oblast. ^ Late September 2013 President Yanukovych stated establishing a free trade zone between Ukraine and the EU "will have a significant positive impact on the economic situation in Europe at large and will help the process of Europe's emergence from the crisis" and that according to experts, this establishment would increase the EU market by almost 7%, the production of goods services in Europe by more than 1%, and the exports of European goods and services to the world markets by almost 1%. ^ The Communist Party of Ukraine wants Ukraine to join the Customs Union of Belarus, Kazakhstan and Russia. ^ Ukraine membership in the Customs Union of Belarus, Kazakhstan, and Russia would end the possibility for an Association Agreement according to statements made by European Commission President José Manuel Barroso in April 2011. ^ The EU may invite the ENP partner to align itself with EU declarations in the field of Common Foreign and Security Policy on a case-by-case basis. Currently, in addition to ENP partners the EU invites for alignment the candidate countries, SAp and EFTA states. Each states decides on a case-by-case basis if to align itself with the particular declaration it is ivited to. ^ The EU takes note of expressed European aspirations by the ENP partner. ^ Ukraine's deputy foreign affairs minister announced that with the adoption of the action plan for the association agreement between EU and Ukraine, the country effectively quits ENP in favour of stronger ties with the EU. The EU ENP website, however, still shows Ukraine as a participating country as of 21 June 2009. ^ Not envisioned in the Action Plan, but invitations sent and accepted by Ukraine. ^ Ukrainian Prime Minister Mykola Azarov stated that the problem that finally blocked the EU deal were conditions proposed for an International Monetary Fund loan being negotiated at the same time, which would require big budget cuts and a 40% increase in gas bills. On 7 December 2013 the IMF clarified that it was not insisting on a single-stage increase in natural gas tariffs in Ukraine by 40%, but recommended that they be gradually raised to an economically justified level while compensating the poorest segments of the population for the losses from such an increase by strengthening targeted social assistance. The same day IMF Resident Representative in Ukraine Jerome Vacher stated that this particular IMF loan is worth 4 billion US Dollars and that it would be linked with "policy, which would remove disproportions and stimulated growth". ^ Ukraine and the EU started "conducting technical preparations for the upcoming dialogue between Ukraine and the EU on certain aspects of the implementation of an Association Agreement" on 5 December 2013. ^ a b c d e f g h i "Ukraine crisis: Timeline". 13 November 2014. Retrieved 11 June 2017 – via www.bbc.co.uk. ^ "Ukraine drops EU plans and looks to Russia". Al Jazeera. 21 November 2013. Retrieved 24 November 2013. ^ a b "Ukraine still wants historic pact with EU". Oman Observer. Archived from the original on 25 January 2014. Retrieved 27 November 2013. ^ a b "Archrival Is Freed as Ukraine Leader Flees". The New York Times. 22 February 2014. Retrieved 23 February 2014. ^ "European Parliament resolution on the results of the Ukraine elections (13 January 2005)". Retrieved 11 June 2017. ^ "Breaking News, World News & Multimedia". Retrieved 11 June 2017. ^ "Portugal supports Ukraine's accession bid to NATO, EU". People's Daily Online. ^ "New enhanced agreement between Ukraine and EU called "Agreement on Association"". Retrieved 23 October 2014. ^ "EUobserver / Ukraine diplomats take risk on EU application". Retrieved 23 October 2014. ^ a b "Sikorski: umowa o małym ruchu granicznym od 1 lipca". Gazeta Wyborcza. 17 June 2009. Retrieved 17 June 2009. ^ a b c "Ukraine, EU Initial Deep And Comprehensive Free Trade Agreement With EU". Ukrainian News Agency. 20 July 2012. Retrieved 29 July 2012. ^ a b "The West Australian". The West. Archived from the original on 19 October 2017. Retrieved 11 June 2017. ^ "Kiyv Post". KyivPost. Retrieved 23 October 2014. ^ Miriam Elder. "The Guardian". the Guardian. Retrieved 23 October 2014. ^ a b "Independent.co.uk". The Independent. Retrieved 23 October 2014. ^ "Ukraine rejects pre-conditions for EU deal". EurActiv. 20 February 2013. Retrieved 22 February 2013. ^ "Ukraine optimistic about signing association deal with EU in November". Shanghai Daily. 14 March 2013. Retrieved 17 March 2013. ^ "Ukraine's Cabinet Backs EU Association Agreement". Radio Free Europe/Radio Liberty. 18 September 2013. Retrieved 20 September 2013. ^ a b c d "Ukraine drops EU plans and looks to Russia". aljazeera.com. Retrieved 21 November 2013. ^ "Ukraine, EU trade talks suspended amidst rallies". CBC News. 2013-12-15. Retrieved 2013-12-24. ^ Chris Morris (2013-11-29). "BBC News - EU rejects Russia 'veto' on Ukraine agreement". Bbc.co.uk. Retrieved 2013-12-09. ^ "Russia And Ukraine Sign Deal Despite Protests". Sky News. 2013-12-17. Retrieved 2013-12-24. ^ "European Union signs landmark association agreement with Ukraine". Reuters. 21 March 2014. Retrieved 29 March 2014. ^ Ukraine ratifies EU association agreement. Deutsche Welle. Published 16.09.2014. ^ Shaun Walker in Moscow and Oksana Grytsenko in Kiev. theguardian.com. Ukraine ratifies EU integration deal. Published on 16 September 2014. ^ a b 17th EU-Ukraine summit, Ukraine, 27/04/2015. European Council. ^ "EU agrees 1.8bn-euro loan to cash-strapped Ukraine". 22 May 2015. Retrieved 11 June 2017 – via www.bbc.com. ^ "Spotlight: Dutch referendum says "No" to EU-Ukraine deal". Xinhua News Agency. 2016-04-07. Retrieved 2016-04-20. ^ "Brexit vote will delay decision on EU-Ukraine deal, says Rutte". EUobserver. 2016-04-14. Retrieved 2016-04-20. ^ "European Council Conclusions on Ukraine (15 December 2016)". European Council. 2016-12-15. Retrieved 2016-12-15. ^ By Gabriela Baczynska and Robert-Jan Bartunek. EU agrees Dutch demands on Ukraine deal to avoid 'present for Russia'. Reuters. Published on 15 December 2016. ^ "Netherlands, EU Reach Deal On Ukraine Association Agreement". Radio Free Europe/Radio Liberty. 2016-12-15. Retrieved 2016-12-15. ^ a b Genin, Aaron (2018-09-02). "PRESIDENT POROSHENKO SEEKS EUROPEAN "PATRONAGE" IN DONBASS REGION". The California Review. Retrieved 2019-04-11. ^ Genin, Aaron (September 2, 2018). "President Poroshenko Seeks European Patronage in Donbass Region". The California Review. ^ "Ukraine-EU Summit Joint Statement (20/12/2011)". Retrieved 23 October 2014. ^ "EU Commissioner: EU, Ukraine May Sign Association Agreement Next Year". PR Newswire. 30 November 2012. Retrieved 31 January 2013. ^ "Füle pours cold water on Ukraine's EU hopes". EurActiv. 30 November 2012. Retrieved 31 January 2013. ^ Auyezov, Olzhas (8 February 2013). "Reform quickly or lose deals, EU tells Ukraine". The Star. Archived from the original on 13 April 2013. Retrieved 9 February 2013. ^ Kościński, Piotr; Vorobiov, Ievgen (20 August 2013). "Ukraine's EU deal: good or bad for the oligarchs?". Archived from the original on 26 August 2013. Retrieved 21 August 2013. ^ "Customs Union may withdraw from FTA with Ukraine if Kyiv signs association agreement with EU". Interfax. Russia Beyond the Headlines. 21 August 2013. Retrieved 10 December 2013. ^ David M. Herszenhorn (22 November 2013). "Ukraine Blames I.M.F. for Halt to Agreements With Europe". New York Times. Retrieved 10 December 2013. ^ Ambrose Evans-Pritchard (22 November 2013). "Historic defeat for EU as Ukraine returns to Kremlin control". Daily Telegraph. Retrieved 10 December 2013. ^ Pop, Valentina (21 December 2015). "Russia Hits Ukraine With Tariffs Over Imminent Trade Deal With EU". Retrieved 11 June 2017 – via www.wsj.com. ^ a b Valentina Pop and Laurence Norman. Georgia, Kosovo, Ukraine’s Visa-Free Access to EU Delayed. The Wall Street Journal. Published on 9 June 2016. ^ "EU demands more reforms from Ukraine to lift visa barrier [fr]". 2013-11-20. Retrieved 2014-01-05. ^ "Commission Progress Report: Ukraine meets criteria for visa liberalisation". European Commission. 2015-12-18. Retrieved 2016-04-20. ^ "European Commission proposes visa-free travel for citizens of Ukraine". European Commission. 2016-04-20. Retrieved 2016-04-20. ^ Gabriela Baczynska. EU puts brake on visa liberalization for now amid immigration fears. Published on 1 June 2016. Reuters. ^ Martin Banks. Poroshenko: Brexit won't prevent EU-Ukraine visa deal Published on 9 June 2016. The Parliament Magazine. ^ a b "Visas: Council agrees its negotiating position on visa liberalisation for Ukraine". Council of the European Union. 2016-11-17. Retrieved 2016-11-21. ^ a b Gabriela Baczynska, Philip Blenkinsop. EU states conditionally back visa-free travel for Ukraine. Thomson Reuters Foundation. Published on 17 November 2016. ^ Ukraine citizens to get visa-free travel to EU. BBC News. Published on 24 November 2016. ^ Gabriela Baczynska. EU unblocks visa-free travel for Ukraine, Georgia. Reuters. Published on 8 December 2016. ^ Cynthia Kroet. EU moves forward on Ukraine, Georgia visa-free travel. Politico. Published on 8 December 2016. ^ MEPs and Council negotiators agree to waive EU visa requirement for Ukrainians. European Parliament News. 28 February 2017. ^ "Three million Ukrainians can soon visit EU visa-free". Retrieved 11 June 2017. ^ "Council of EU finally approves visa-free regime for Ukraine - 11.05.2017 11:26 — Ukrinform News". Retrieved 11 June 2017. ^ "Ukrainians Wave 'Final Goodbye To Russian Empire' As Visa-Free Travel To EU Begins". Radio Free Europe/Radio Liberty. 2017-06-11. Retrieved 2017-06-10. ^ a b Konoplyanik, Andrei; Wälde, Thomas (2006). "Energy Charter Treaty and its Role in International Energy" (PDF). Journal of Energy & Natural Resources Law. International Bar Association. 24 (4): 523–558. ISSN 0264-6811. Archived from the original (PDF) on 19 August 2011. Retrieved 8 May 2010. ^ "Directive 2003/55/EC of 26 June 2003 concerning common rules for the internal market in natural gas". Retrieved 23 October 2014. ^ "Ukraine's Accession Protocol to the Energy Community" (PDF). Retrieved 23 October 2014. ^ a b c d European Commission/Eurostat paper issued before 9 September EU-Ukraine summit in Paris. ^ "ENPI Info Centre". Retrieved 23 October 2014. ^ "EU-Ukraine summit, Brussels, 24/11/2016 - Consilium". www.consilium.europa.eu. Retrieved 11 June 2017. ^ "European Commission - PRESS RELEASES - Press release - Brussels, 7 May 2009 Joint Declaration of the Prague Eastern Partnership Summit, Prague, 7 May 2009". europa.eu. Retrieved 11 June 2017. ^ "European Commission - PRESS RELEASES - Press release - José Manuel Durão Barroso President of the European Commission Statement by President Barroso following the Eastern Partnership Summit Eastern Partnership Summit Warsaw, 30 September 2011". europa.eu. Retrieved 11 June 2017. ^ Viktor Yanukovych: Losing Europe...and Losing the Ukrainian Public?. Brookings Institution. November 18, 2013. ^ Год в цифрах. www.unian.net. Published on 28.12.2014. ^ (in Ukrainian) Ukrainians do not consider relations with Russia a priority and MS support has fallen to 12%. unian.ua. 23.04.2015. ^ Andrew Rettman (22 October 2010). "EUobserver / EU unlikely to expand into post-Soviet east in next decade". Euobserver.com. Retrieved 7 January 2011. ^ Juncker Says Ukraine Not Likely To Join EU, NATO For 20-25 Years. Radio Free Europe/Radio Liberty. Published on 4 March 2016. Dezseri, Kalman [ed. ]: Economic and political relations after the EU enlargement: the Visegrad countries and Russia, Ukraine, Belarus and Moldov, Budapest 2004. Wolfgang Tiede and Sabina Krispenz: "Die Ukraine auf dem Weg in die Europäische Union?" ("Ukraine on the way to the European Union?" in Osteuropa-Recht (OER)) 2008 (German Law Journal), vol. 6, pp. 417–426. Wolfgang Tiede and Christina Schröder: Die Ukraine auf dem Weg in die NATO? ("Ukraine on the Way to NATO Membership? "), in Osteuropa-Recht (OER) 2009 (German Law Journal), vol. 3, pp. 294–304 (in German). Andreas Umland: „Europa und die ukrainische Misere: Weil die EU dem Land eine Mitgliedschaft gar nicht in Aussicht stellt, trägt sie zum Chaos in Kiew bei. Ein historischer Fehler", in: Frankfurter Allgemeine Sonntagszeitung, 1 November 2009, p. 15 (in German). Wolfgang Tiede and Jakob Schirmer: "Strategische Notwendigkeit – Die Östliche Partnerschaft der Europäischen Union" ("The EU’s Eastern Partnership"), in "WeltTrends" (Zeitschrift für internationale Politik und vergleichende Studien), 71/2010, pp. 10–14 (in German). Wikimedia Commons has media related to Relations of Ukraine and the European Union.